Flat and corrugated sheets and rolls made fibreglass reinforced polyester. 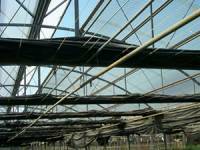 Translucent and semi-opaque for every shape of civil or industrial roof, in agriculture for greenhouses and breeding installations, covered walkways, various types of protection and cladding. STRAIGHT CORRUGATED SHEETS: that are used to build continuous covered walkways, partitions, protection, combined with opaque materials such as corrugated metal sheets, fibre- cement sheets, bitumen sheets and others. ELYTOP K, ELYLUX K, ELYT STRAIGHT CORRUGATED SHEETS: in agriculture for greenhouse and tunnel roofing. STRAIGHT RIBBED SHEETS: sono used to build continuous covered walkways, protection and combined with sheet metal and aluminium sheets. There are available in about 150 profiles which correspond to the number of sheet metals produced by companies on the market. OPAQUE ELYONDA STRAIGHT SHEETS: available in the CORRUGATED and RIBBED versions, they are used in civil and industrial buildings as a final roof covering or a vertical closing. A wide range of translucent, cover and opaque colours. The possibility to choose among over 150 types of profiles which can be matched with the main ribbed sheet metal available on the market. Resistance to chemical agents: ELYPLAST laminates are not altered by the following acids in the listed solutions depending on their concentration and on a testing temperature ranging from 30° to 50° C.
ELYPLAST laminates in the standard version are not flammable, but burn without dripping, if they come into contact with flames. Depending on the manufacture thickness, they belong to the Class 3 or 4 as defined in the Min. Decree, dated 26/06/84, "Fire reaction classification and type-approval of materials for fire prevention purposes" modified by the Min. Decree, dated 03/09/01. Modifications and integrations to the 26/06/84 Decree concerning the reaction to fire classification and type-approval for fire prevention. ELYPLAST laminates are also available in the self-extinguishing version CLASS 1 (Min. Decree, dated.26/06/84 and Min. Decree, dated. 03/09/01). ELYONDA: Reaction to fire certificate N. CSI/0244/01/RF, dated 01/12/01 issued by the CSI , class1 1 (Min. Decree, dated 26/06/84 and 03/09/01). ELYONDA: Type-approval, dated 16/06/03 for fire prevention, issued by the “Department of the Interior Type-Approval N° MI380A60D10007. It is an opaque fiberglass sheet made in continuous production, characteristically resistant and long lasting. It replaces fibre- cement, corrugated and ribbed steel or aluminium sheets in all roofing and cladding applications on agricultural, civil and industrial buildings. Resistant to the action of chemical agents. Load-bearing range: Kg 300/m2 >, uniformly distributed weight, (safety factor 3) with a distance between the supports of 1.00 m.
Water absorption 0.2% after 48 hr of dippingColours available: (charcoal, anthracite, light) Grey, Brick Red, Green. Length on request up to the dimensions that can be transported. ELYT: sheets with TEDLAR polyvinyl fluoride film, highly U.V-ray resistant. and to sheet surface yellowing. ELYX: sheets with MELINEX polyester, resistant to atmospheric abrasion and early fiberglass surfacing. ELYTOP K: the ELYTOP K sheets, are made of CRISTAL polyester resin, U.V.stabilised, fiberglass reinforced, protected on both sides with selected resins coating, hot bonded during lamination (gelcoat). This protection ensures good structural and functional capacity over time. ELYK: Sheets made of Cristal polyster resins with meta-acrylic polymers added. Their main property is high transparency which allows light to pass almost like glass. ELYLUX K: lastre sheets made of Cristal polyester resin, U.V.stabilised, fiberglass reinforced and with MELINEX 389 film protection on both surfaces. This protection resists over time and maintains good functional and aesthetic properties. Questa protezione permette notevole resistenza nel tempo mantenendo buone caratteristiche funzionali ed estetiche. Height on request up to a maximum of 12.00 m that can be transported. 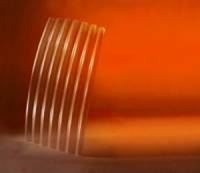 The surface of ELYPLAST 494-496-497 precurved sheets is manufactured with a MELINEX 301 polyester film protection. Standard precurved sheets C 177 - C 146 with variable radiuses (9-17 m) are not supplied with surface protection. On request , precurved sheets can be manufactured with abrasion-proof MELINEX 301; U.V. resistant MELINEX 389 and anti-ageing TEDLAR protections. The TEDLAR protection ensures greater sheet resistance to U.V ray degradation and to other corrosive elements found in the atmosphere, making sure that 80% of the initial light transmission is maintained.